February 4: Super Bowl Sunday!! Go Patriots! It’s another good day with Tyonek. It’s getting more challenging to think of new and exciting enrichment to do with him. Today I played “rock band” for him; banging on a Rubbermaid container like a drum, while singing the Star Wars theme into a tube that was in the water. Also playing him some music from the poolside, I chose Justin Timberlake’s new album “Man of the Woods” in honor of the halftime show to come. Tyonek continues to do well with the whistle conditioning. He seems to have picked up on the fact that each bottle is being broken into smaller offerings. This is done so that we can make sure he is hearing the whistle more often during each feeding session. Animals, like humans, learn through repetition so the more he hears the whistle, the more familiar it will become to him. He should start to associate the sound with food. February 5: Well, the Super Bowl didn’t go the way New England fans were hoping it would; but, it was still a great game! Today it was business as usual during my shift with the exception of doing a live broadcast for a distance learning program! 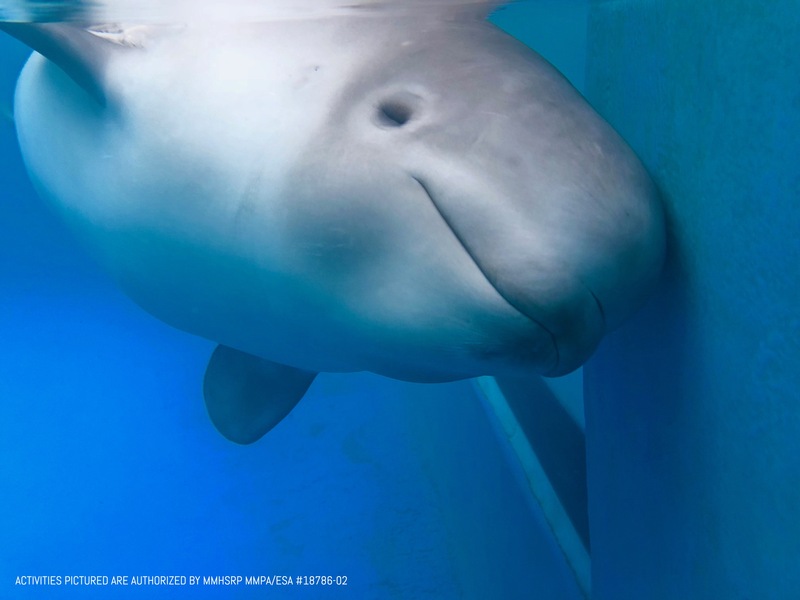 We had a group of students from a school in Tyonek, Alaska, the village that the beluga calf was named after, join us via a live broadcast to watch a feeding and ask questions of Lisa Hartman, Husbandry Manager at Alaska SeaLife Center (ASLC). This particular class had the opportunity to participate in a distance learning program a few months ago so they were really excited to see him again! The kids enjoyed seeing how much Tyonek has grown and had some great questions to ask Lisa. It is great to see how this little whale is inspiring our future generations to care for our environment. These students are gaining a better understanding of the role that zoos and aquariums are serving in Tyonek’s continuing success story. Another great day doing what I love! February 7: Things continue to go well here in Seward, Alaska! I experienced my first newly fallen snow overnight. Just a couple of inches but it made the scenery even more beautiful. I am a big fan of snow when I don’t have to shovel it or drive very far in it! Today at the Alaska SeaLife Center (ASLC) I continued with crossover with Andrea Oakes from Shedd Aquarium who works the 4:00PM-12:00AM shift. Together, the three visiting trainers have started to desensitize Tyonek to an important husbandry tool-a stomach tube. Cetaceans at zoos and aquariums are trained to open their mouth and allow a clear tube to be inserted down their esophagus into their first stomach to obtain a sample of gastric fluid. This important diagnostic tool allows veterinarians to monitor digestive health. 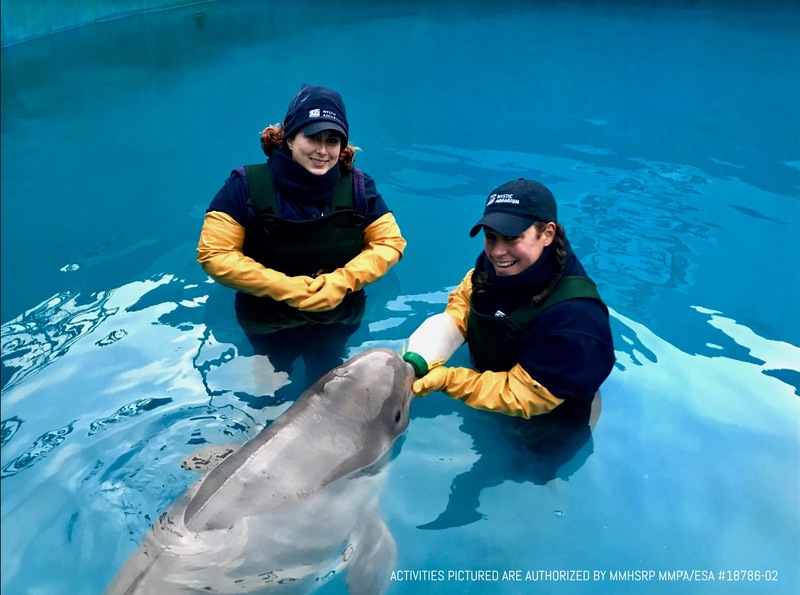 At Mystic Aquarium both Juno and Kela participate in behavioral gastric sampling each month to ensure they are in good health. The first steps in training this behavior are through desensitization which is the process of getting an animal accustomed to a novel stimulus through exposure. The goal of desensitization is for the animal to eventually have a neutral response to the stimulus. This can be achieved by utilizing a few different methods in animal training. With Tyonek we have chosen to utilize active desensitization, or counter conditioning, by pairing the stimulus (in this case the stomach tube) with primary reinforcement (the bottle). For the stomach tube, we started by simply wearing the tube around our necks during bottle feeds. Over time, when he showed no response to the tube’s presence, we started to place the tube near his mouth before offering him the bottle. With approximations, we have gotten to the point where he will open up his mouth and allow the trainer to slide the tube towards the back of his tongue while remaining engaged with the trainer. He does not pull away or back away from the presence of the tube. He is doing very well with his stomach tube training! While Tyonek still has a lot to learn before he is allowing a gastric sample to be taken behaviorally, the other trainers and I are very excited to be a part of his initial training! As with training any behavior, consistency is the key. Andrea, Liz, and I are very good about watching each other’s feedings and approximations during our shift crossover as well as recording each feeding and desensitization session with video and/or written observations. It’s wonderful to see trainers from different facilities continuing to come together to support Tyonek as he grows and learns. February 8: Today was a big day for Tyonek as NOAA (National Oceanic and Atmospheric Administration) and National Marine Fisheries Service (NMFS) met to make the determination of his permanent home. Since Tyonek was declared non-releasable due to various circumstances and conditions, it was time to choose a long-term facility for him! I waited with baited breath (pun intended) to hear the announcement. When it finally came, I was very pleased to hear that he will be residing at SeaWorld San Antonio. 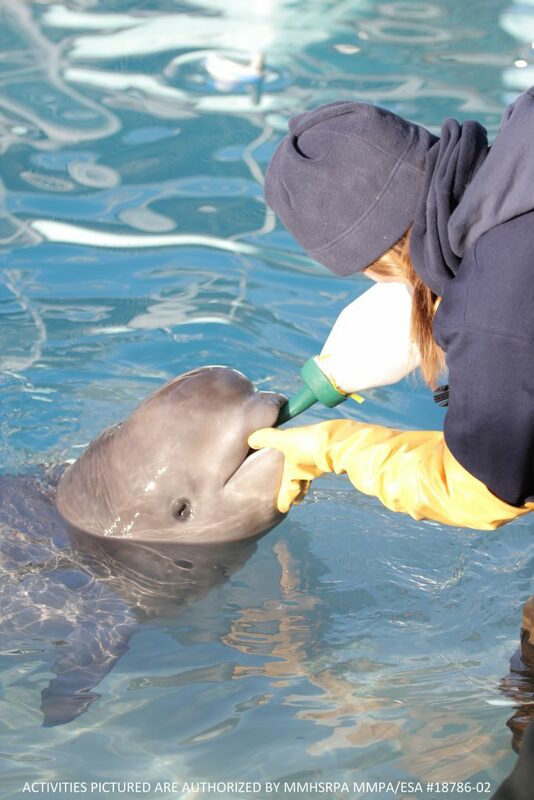 This facility has an excellent beluga breeding and husbandry program as well as an appropriate social group for Tyonek; including young animals and an experienced mothers. Both of these factors will be an asset to his development allowing him to thrive with and learn from other whales. An exciting announcement for everyone involved with this little whale! February 9: In addition to desensitization with the gastric tube that I described in an earlier entry, we have continued utilizing similar methods with the stretcher. (My colleagues Jessie Ciletti & Laurie Macha touched on this in their blogs as well). One trainer will hold the stretcher near Tyonek while the second trainer feeds him his bottle, creating a positive association with the stretcher. We also began moving the stretcher so that it touches him during his feeding. He is showing no reaction so it seems our desensitization is working! This morning, the visiting trainers and I had a chance to put our training into use to get Tyonek into the stretcher for some morphometric data. The veterinary team wanted to get some measurements on Tyonek in anticipation of his eventual transport to SeaWorld San Antonio. The measurements require removing Tyonek from the water via the stretcher. This allows the staff to lay him on foam padding on the pool deck and use a measuring tape to get dimensions of his length, axillary girth -or how round he is-as well as to examine his internal organs through ultrasonography. Having him in the stretcher also enables staff to get an updated weight by suspending it from a scale. Tyonek allowed the stretcher to be brought up around him while he was drinking from his bottle, just like we’ve been practicing. We were all so proud of him! 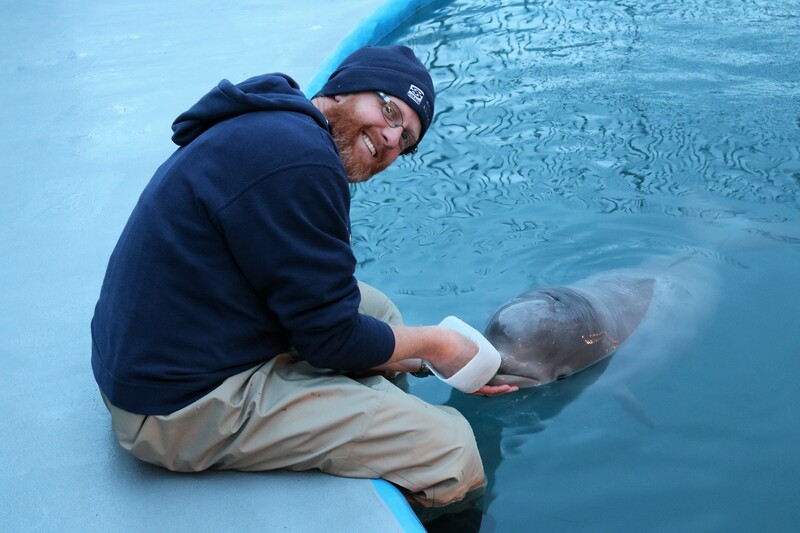 It was a great bonding moment for the three of us; seeing how working together to teach this little whale through the use of positive reinforcement and relationship building is already helping make his care easier. As we stood there taking turns feeding him his bottle after the procedure was over, we were all smiles. You could feel the camaraderie between all of the facilities that have come together to help Tyonek during his continued rehabilitation. This was definitely one of the best moments I’ve had on this trip so far!